J.E.M. Door Co. Ltd are specialists in the manufacturing of the polycarbonate line of overhead door products and are the originators of the first polycarbonate translucent overhead door used in North America in 1976. A main feature of the polycarbonate door - apart from its attractive appearance - is its light weight which results in easy operation with less stress on the related hardware components, and therefore less maintenance. In addition to this, our translucent overhead doors are an excellent natural source of sunlight for virtually any application. By using a polycarbonate triple wall sheet we are able to transmit up to 83% of available light while rejecting the extreme brightness and heat caused by the hot summer sun. For all types of industrial, commercial, residential, and institutional overhead doors. Particularly suited for service and maintenance garages where an attractive, light-transmitting, strong, and lightweight door is desired. The unique feature of our door's ability to screen out the undesirable summer heat and also retain the internal winter warmth adds up to tremendous energy savings. The doors have successfully passed stringent tests in different locations during the many winters, with some of the sites being over 1,000 km (600 Miles) north of Toronto Canada. This area had temperatures of -40oC (-40oF) with the doors operating perfectly. Absolutely no frost built up on the inside. Energy savings were very significant when the doors were installed on the northwest side of a heated building. If the doors would have been installed on the south side of the building, the savings would be even greater. 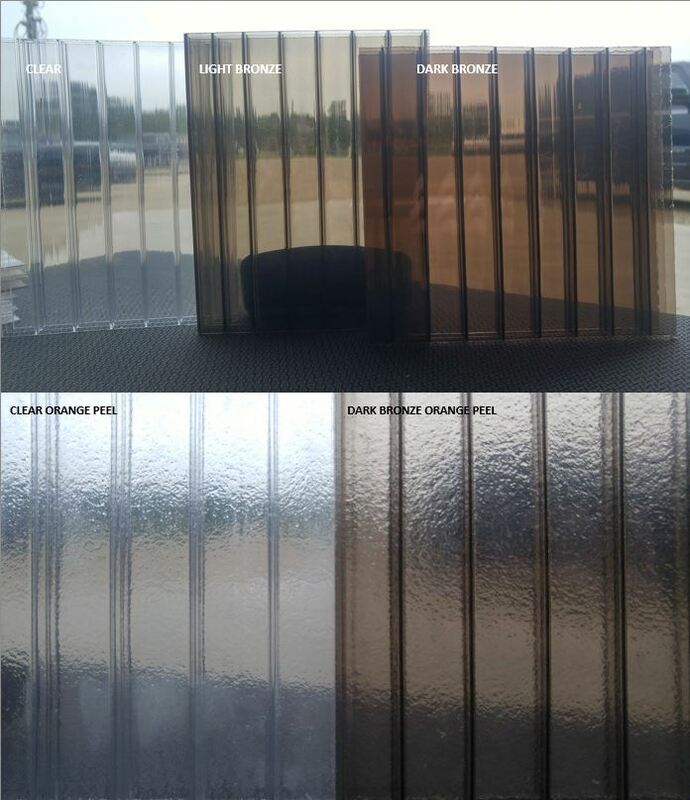 Translucent polycarbonate sheet is available in clear, light bronze or dark bronze finish. Colours are integral with plastic for permanent maintenance-free finish. Standard aluminum finishes include clear anodized and bronze anodized. Other finishes are available through our powder coating service. The unique combination of the light weight, energy efficiency, and aesthetic appeal, makes the use of a "POLYDOOR" an attractive proposition. All of our doors are custom designed to the specific measurements needed, and the tracking is composed of standard equipment allowing for easy repair if necessary. Heavier and more rigid than most light-transmitting doors. Weight - 1.75 lbs./sq. ft. The construction of the POLYDOOR® overhead door is lightweight compared to steel insulated doors. This allows for less stress on the operators and related hardware. Less stress on structural building frames. Polycarbonate panels are heavier and more rigid than other triple wall polycarbonate sheet products. Polycarbonate sheets are virtually unbreakable. Panels will not rust or rot. Polycarbonate sheet can be cleaned with mild soap and water. If mistreated, bottom rails may require replacement. 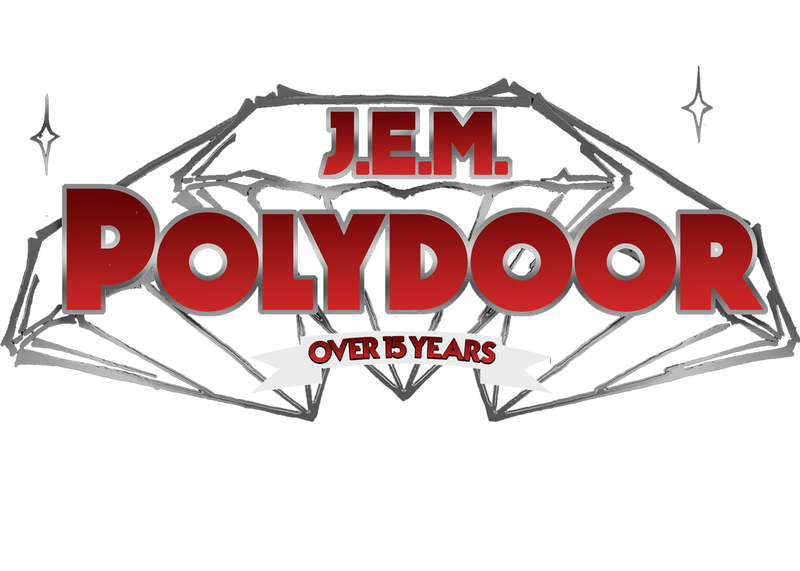 POLYDOOR® rails are easily and quickly replaced without de-tensioning of the torsion springs. Reduce heating costs due to positive solar gain. Provides pleasant working area and lower lighting costs due to high light transmission. J.E.M. have been manufacturing polycarbonate overhead doors for over 20 years. J.E.M. has developed the first patented triple wall polycarbonate door product in North America. J.E.M. provides service to all of our doors. Contact us if the door gets damaged or a manufacturing default occurs. We will come to your location and service the doors. To find out more about our service range, and the types of services we can offer, CALL US TODAY!